Saddam Hussein has a legacy of one of the most brutal rulers of the 20th century, the results of which are still felt to this day. 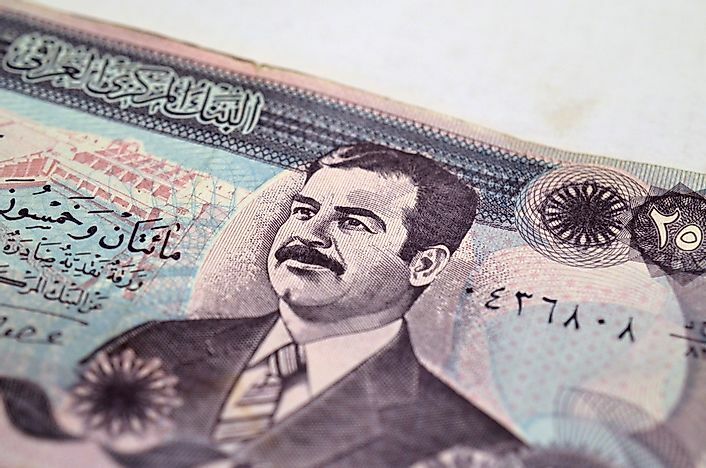 A banknote featuring Sadam Hussein. Saddam Hussein was born on April 28, 1937, in Tikrit, Iraq. He was born into a family of peasants, but managed to rise to the highest levels of power in Iraq within his lifetime. Given the name Saddam, which means "one who confronts", Hussein attended Al-Karh high school in Baghdad, and studied law at Baghdad Law College before joining the nationalistic Ba'ath Party at the age of 20. Only 1 year after joining, Hussein participated in the 1958 overthrow of King Faisal of Iraq. This revolution built the foundations for what was Ba'athist Iraq from this point until 2003. Abd al-Karim Qasim would assume power in Iraq and the country would remain unstable politically. Saddam Hussein eventually became involved in a plot to assassinate the president in 1959. This plot failed and Hussein fled to Syria (a friendly country to Ba'ath party members), before settling in Egypt until 1963. Hussein continued his study of Law at Cairo University. Hussein's contributions to Iraq and the world at large were overwhelmingly negative. Hussein oversaw massive human rights abuses, such as the treatment and bombing of Kurdish peoples, as well as the creation of a secret police force that would eliminate or detain political "enemies". Many innocent people were tortured during the rule of Saddam Hussein and the psychological effects of this are still felt today. Hussein's confrontational nature with the United States lead to the Iraq War of 2003. With a savage group such as ISIS rising up from this battlefield, this war has had a legacy that is still relevant today. While Hussein was in Egypt, the Iraqi armed forces had overthrown Qasim in the Ramadan Coup of 1963. Hussein returned to Iraq and was imprisoned in 1964; this was due to the assumption of Hussein's political aspirations and how they may be dangerous to the current rulers. Escaping prison in 1967, Hussein was on a mission to reunite the traditional Ba'ath party. In 1968, Ahmed Hassan Al-Bakr took power with Hussein's help, who became his deputy. By 1976, Hussein had risen to General of Iraq's armed forces, effectively the enforcer of the Al-Bakr government. On the July 16, 1979 Hussein forced Al-Bakr out of the presidency due to his personal disagreements surrounding Al-Bakr's political policies, namely the unification of Iraq and Syria. Instead of fading into obscurity under this unification, Hussein instead assumed the presidency and quickly tried and executed many who he saw as his political enemies. Hussein seemingly faced self-imposed challenges throughout his rule. On September 22, 1980, Hussein launched an attack on Iran. One of the bloodiest attacks in recent history, 1 million lives were lost during the war that lasted 8 years. Iraq incurred $70 billion of debt during this war. On August 2, 1990, Hussein invaded Iraq's neighboring country of Kuwait. This invasion lead to retaliation from the United States of America (as well as other nations) and on January 17, 1991, Operation Desert Storm began. Iraqi armed forces were swiftly removed from Kuwait and Iraq would face military no-fly zones, as well as harsh economic and military sanctions for the rest of the 1990s and into the 2000s. On March 19, 2003, after almost 2 years of strong rhetoric between the United States and Iraq, Operation Iraqi Freedom commenced. All of the conflicts drained Iraq economically which lead to domestic instability and further human rights abuses. Saddam Hussein was captured by American forces on December 13, 2003 and was imprisoned. After a lengthy trial, Hussein was hung on December 30, 2006. This execution was one of the first videos to spread across the internet at a rate that was almost instant. Many who watched it were shocked at the level of raw violence as well as Hussein's treatment by his captors before his execution. However, his legacy is that of a cruel dictator who did not care about human rights. Following in the footsteps of many famous dictators, Hussein was seemingly always at war. This could have been due to Hussein's belief of uniting Iraqi people under a cause and diffusing domestic tension. This would focus his citizen's attentions on an external tormentor, rather than the tormentor who was in fact their president.